The Meg delivers everything you could want from a blockbuster popcorn flick! I suspect that the pitch for The Meg went something like this: “Picture this: Jason Statham versus a prehistoric shark, and –” but then their words were cut off because the studio just started throwing money at them until they were buried in it. Now, I wasn’t there, but I’m pretty sure that’s how it went down. See, The Meg is the perfect way to close out the summer. It’s big, it’s loud, it’s full of high-octane action (would you want any other kind? ), plenty of cheesy lines, and did I mention that Jason Statham battles it out with a gigantic friggin’ prehistoric shark? It’s everything you could want from a blockbuster popcorn flick! Based loosely on the book by Steve Alten, The Meg stars Statham as Jonas Taylor, a former Naval Captain and rescue diver who has put his days at sea behind him after a deep-sea rescue went wrong, forcing him to leave his two friends behind in order to save everyone else. That was five years ago, but today his skills are needed once again, as his ex-wife Lori (Jessica McNamee) and two other crew members are trapped beneath the Marianas Trench after their submarine was attacked while on a discovery mission — and only Jonas knows what did it and what it’s truly capable of. The short answer is: Oh, hell yeah. The Meg knows what kind of movie it is so it never takes itself too seriously. There’s some time taken to build on a few relationships, as well as a few heartfelt moments scattered throughout, but for the most part the movie is focused on delivering the tension-filled, over-the-top giant rampaging shark madness that you paid to see; allowing the audience to just sit back, chomp on their popcorn and enjoy while the megalodon takes a bite out of pretty much everything on-screen. 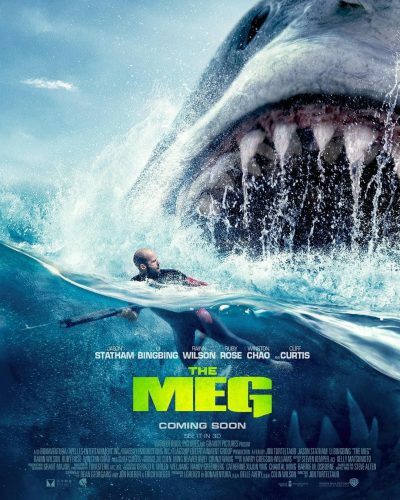 And Statham is the perfect actor for a film like this, as his presence alone causes The Meg to be taken a bit more seriously than movies like Sharknado, while at the same time being fully aware that no matter how ridiculous the concept may be, no matter how implausible the scenario, arguably the biggest reason audiences are buying tickets to The Meg is to see Jason Statham jump into the ocean and take on this 70-foot behemoth of the sea like only he can. It’s clear from the final product that everyone involved had a blast filming this movie. What could’ve easily been a throwaway made-for-TV movie about another poorly animated CGI giant shark is brought up to Hollywood popcorn blockbuster levels because of the crew both in front of and behind the camera. The cast has some great chemistry, especially when it comes to the leads. Statham and Bingbing have a fun relationship that blossoms nicely as the film progresses, and their playful delivery — sometimes during quite dangerous moments — only adds to the popcorn movie vibe the film consistently exudes. The same goes for the comedic relief that comes from two very different sources in Wilson and Sophia Cai, who plays Suyin’s daughter, Meiying. While the billionaire financer in these movies is often cliche and evil, Wilson’s character seems to have a heart, is actually fun and also delivers some of the best lines in the movie. Cai’s chemistry with Statham and Bingbing also lightens up the movie in often silly, enjoyable ways when it’s needed. Director Jon Turteltaub (National Treasure, National Treasure: Book of Secrets) fully embraces the material and balances the comedy, action and suspense quite well. And the design team for the megalodon nail it, allowing for some astonishing shots that fully showcase the size of the beast. Some may find the film has a few slow points over the course of its two-hour runtime, but the last 30 minutes or so don’t let up so I didn’t really have an issue with the film stopping to breathe a few times. Are there some things you can knock the movie for? Sure, it has a few flaws; but none are big enough to detract from the sheer entertainment value the film has to offer. I mean, what it really comes down to is this: do you want to see Jason Statham take on a gargantuan prehistoric shark? That was rhetorical because if you said no than you clearly didn’t understand the question. Go catch The Meg in theaters before it gets away. Writer(s): Dean Georgaris, Jon Hoeber, Erich Hoeber. Based on the novel by Steve Alten.